November opened with the rockabilly sound of Big Sandy and His Fly-Rite Boys. Not only was the music great but Sandy was a total entertainer. Ashley Kingman’s guitar playing was spot on. For second set, the band was joined by Mark Roeder on steel guitar. Fareed Haque, Tony Monaco and Greg Fundis. Terry O best described the performance on Facebook. In the words of Madison Music Collective describing Sharel Cassity’s performance on November 23 and 24th. “A great writer and performer with a fantastic band”. December will open with Howard Levy 4. Multi Grammy -Award winner Howard is a world-renowned harmonica player/pianist/composer. He has performed with many of the world’s top musicians, Steely Dan, Kenny Loggins, Paquito D’Rivera, Bela Fleck and the Flecktones…to name a few. Before we put the month of October behind us; let me tell you about my very favorite night, Tuesday, because it’s the New Breed Jazz Jam with Paul Hastil, Nick Moran and Michael Brenneis, and being a jam, there is always the element of surprise. October 12 - The Josh Harty Band and Lost Lakes shared the stage. Beautiful harmonies throughout. They closed with Greensleeves, until this performance the only live version of Greensleeves I had heard was by Pharoah Sanders (a Coltrane disciple). I don’t use the term monster lightly, but Ryan and the band smoked. The performance by all members was monstrous. October 19 - An all-star event. Darren Sterud invited Leroy Jones of Preservation Hall to perform at North Street Cabaret. I knew that Leroy would be great on the trumpet, but it was his voice and his singing that absolutely captivated me. October 20 - Ben Ferris Octet featuring Eric Koppa on tenor saxophone performing many of Oliver Nelson’s compositions from his album The Blues and the Abstract Truth. Doesn’t get any better. Sunday, October 28 - Chris Duarte Group. I’m so appreciative that NSC is not strictly a one genre venue. Chris’s name is mentioned with the likes of B. B. King, Stevie Ray Vaughan, Buddy Guy and Eric Clapton. The group absolutely burned the stage. The one thing I really love about Chris is that he does not ease into anything. He gets right into it from the very first note. The Group performed two 75-minute intense sets. Nobody in the audience left. Great night, great month. Thank you all. Please vote on November 6. About three years ago, when it was decided that the building at 610 North Street would be dedicated to music and the arts, I started to think of all of the programs that I had wanted to produce if and when the opportunity ever presented itself. “Women in Jazz” was something stirring in me for quite some time, and with the awareness of the moment, it became even more relevant. I reached out to several female musicians that I have known throughout the years (still working on a time that they can fit Madison into their schedule) and some that I have never met. I contacted Sharel Cassidy’s agency https://www.sharelcassity.com/ and offered November 22 and 23. About that same time I received an email from Katherine Kramer about booking “Jazz on Tap” the notion was unique and intriguing, but when she told me of who would be performing with her I was all in. Roberta Piket and Virginia Mayhew are standouts in their own right, and in combination with Madison’s Laurie Lang and Milwaukee drummer David Bayles I was absolutely sold and it gave me a perfect opportunity to declare the start of “Women in Jazz”. Jazz on Tap came to fruition on Thursday, October 4 and it was all that I hoped it would be, using our space as an artistic platform. Last August I reached out to New York saxophonist Roxy Cross (hopefully coming soon) and found this information on her website. 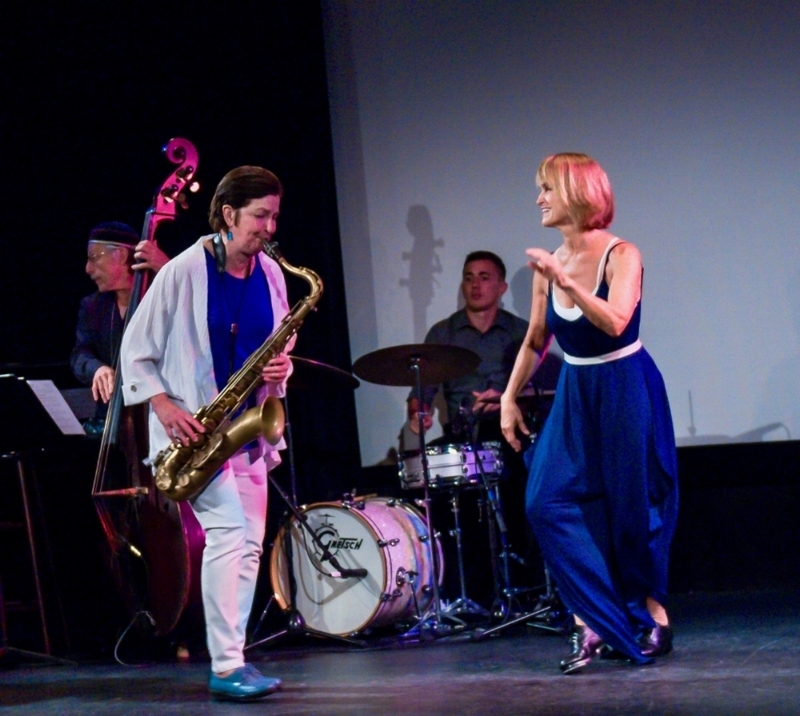 WOMEN IN JAZZ ORGANIZATION INTENDS TO HELP LEVEL THE PLAYING FIELD IN JAZZ, SO THAT WOMEN AND NON-BINARY PEOPLE HAVE AN EQUAL OPPORTUNITY TO PARTICIPATE IN AND CONTRIBUTE TO JAZZ, LEADING TO AN IMPROVED AND MORE RICH, DIVERSE, AND SUCCESSFUL ARTFORM. THE ORGANIZATION IS COMMITTED TO HONORING BLACK AMERICANS AS THE CREATORS OF JAZZ. WIJO aims to empower the individuals within the organization, as well as coming together in solidarity to empower the larger community of jazz musicians who identify as women or non-binary. WIJO works to address inequalities in jazz culture, to change the landscape of the current jazz scene. WIJO also works to improve the perceptions and treatment of women and non-binary people in jazz from outside the jazz community. WOMEN IN JAZZ ORGANIZATION IS A COLLECTIVE OF PROFESSIONAL PERFORMING JAZZ MUSICIANS WHO IDENTIFY AS WOMEN OR GENDER NON-BINARY. LARGELY A NEW YORK CITY-BASED ORGANIZATION, WITH CONNECTIONS TO OTHER INDIVIDUALS AND GROUPS NATIONALLY AND INTERNATIONALLY. I first met Fareed in the 1980’s at The Piano Man, a jazz bar I was involved with in Chicago. A bar dedicated to presenting the best in live jazz and blues. We lost our lease before I had the opportunity to book him. After totally leaving the bar and music business for 30 years, I found myself back at it in Madison. A month after I moved to Madison, I went to the Waterfront Festival, and there was Fareed. I said to myself, if I ever have the opportunity to book music again, I will for sure book Fareed. Last night Fareed Haque and His Funk Brothers performed at North Street Cabaret. They were phenomenal. I am so appreciative of fulfilling this dream and so appreciative of the great Madison audience. It is truly a pleasure to bring the best that I can to you. Without you, the audience, our stage would be silent. Thank you. As a life-long listener of jazz, world and classical music, I didn’t know much about bluegrass, even though I often talked about the virtues of roots music. Moving to Madison five years ago, in the interest of serving my listening audience at Tip Top and now North Street Cabaret, I expanded my horizon to bluegrass and country. Thursday night, Rob Ickes and Trey Hensley absolutely blew me away. Not only are they gifted musicians, but they cross genres, take songs from one world and transform it into another. They borrowed from Stevie Ray Vaughn, Grateful Dead, and even The Beatles. They also performed a version of Sonny Boy Williamson/Willie Dixon song One Way Out (made popular by the Allman Brothers). Thank you Sugar Maple Music Festival for including our venue in your shows. Hope they return to our stage soon. Joe Segal, owner of Jazz Showcase, America’s oldest jazz club, proclaimed August to be Charlie Parker month. Charlie Parker was born August 29, 1920 in Kansas City. He started playing saxophone at 11. He would practice for 12-16 hours a day in the woodshed. “Woodshedding” became a common term used by jazz musicians for practicing. Charlie Parker was the leading innovator of a form of jazz known as Bebop. At first, it was rejected, just as Hip Hop and Rap were rejected not long ago. Friday, August 10, North Street Cabaret will host musician/composer Shawn Maxwell. Shawn plays saxophone, clarinet and flute. 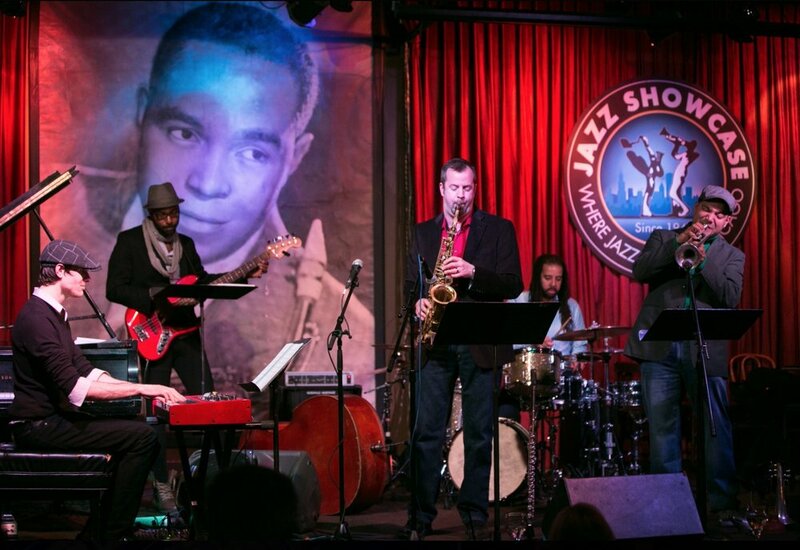 Shawn Maxwell’s New Tomorrow performing at Jazz Showcase under the watchful eye of Charlie Parker. “In the mid 1960’s, when I was too young and didn’t have any money. I stood outside of the Plugged Nickel in Chicago, because on the other side of the wall there was a performance by John Coltrane, Alice Coltrane, Pharoah Sanders, Jimmy Garrison, Jack Dejohnette & Rashid Ali. Tonight, I am very pleased to have a Coltrane in the house”. Those were my introductory words about my guest, Michelle Coltrane, on Thursday, July 12. Michelle was backed by 3 members of the Milwaukee Jazz Orchestra, Curt Hanrahan on reeds, his son Tim on bass and brother Warren on drums. With special guest, guitarist Shae Welsh. I always expect for jazz musicians to be of a high caliber musically, As one who never had the chops, I know the rigors needed to become a jazz musician, but when they bop their hearts out, that makes for a very special concert. That was the case on this evening. North Street Cabaret was the perfect venue for the 80+ in the audience. Great acoustics, great music and a very appreciative audience. Only about a year had passed since my standing outside of The Plugged Nickel, when I met a friend in Chicago’s Old Town district (where The Plugged Nickel was located) and he told me that Coltrane had died. It was July 17, 1967. He was only 41. My heart sank. My world stopped spinning for a moment. The name Coltrane evokes very special feelings for me. His music did and still does have a very deep place inside of me. When I attended art school and pursued my photography seriously, I listened to Coltrane and experimented with my images, leaving the shutter of the camera open and moving to the music. I tried to duplicate visually what Coltrane was trying to achieve in his music, creating "sheets of sound", as he called it. Very little of these images remain. This is one. The power of music is great. I’m fortunate to be playing a role in it, as small as it is. This first blog is dedicated to Tommy Ponce, who brought jazz home to me and who dubbed me Al of the Universe. To Bill, the owner of Piano Man, who had the vision of turning a long-time neighborhood tavern into a world class jazz bar. And of course, brother Benjamin who is forever seeking a higher ground. In the 1980’s I got involved with The Piano Man (2 blocks north of Wrigley Field). The goal was to be the best jazz and blues bar possible. In the beginning there was Dixieland on Sunday afternoons. Added more music on weekends. Eventually the Sunday afternoon Dixieland turned into a regular jazz jam led by Chicago’s multi-instrumentalist Tommy Ponce and his quartet. In no time, jazz increased to seven days a week with the addition of The Sons of the Blues (3-time Grammy nominee Billy Branch and Lurrie Bell, the son of the legendary blues man Carey Bell) on Sunday nights. The Piano Man was an incredible scene, after a five-year run, the music stopped in 1985 because of lease issues. I thought that it was a once in a lifetime experience, that the magic couldn’t possibly be repeated.…fast forward thirty-two years and North Street opens. As we celebrated our first anniversary on June 9, I reflect on our achievements and imagine what is yet to come. We’ve had some great talent on our young stage; we opened with Quebec band Les Poules å Colin and soon after hosted Septeto Santiaguero from Santiago, Cuba. But really, it is the local talent that is so amazing. Per capita, I can’t think of a more talented city than Madison. We are most fortunate. This summer we have had the good fortune of booking the newly inducted into Afro Pop Hall of Fame Zimbabwe’s Mokoomba and the sound of Sahara legend Vieux Farké Toure from Mali.